We had an early morning train to Agra. Surprisingly quick, on time and clean. A first for Indian railways so far. We negotiated the train station and took tuk-tuks to our hotel. We had a Costa for breakfast, exactly like the U.K but the food was all flavoured with Masala. The group decided to visit the Taj and Agra Fort the following day and do other sites first. A mistake we thought but went with the majority. We looked up top sights and discovered a stunning tomb just outside the city- Fatehpur Sikri, one of three Unesco world heritage sites in Agra. Unfortunately the taxi our guide organised for us got pulled over by the police and turned up to late. Knocking that on the head we opted to visit the Baby Taj (so called by tourists). Baby Taj was beautiful and quaint. Far fewer crowds too, which was welcome. 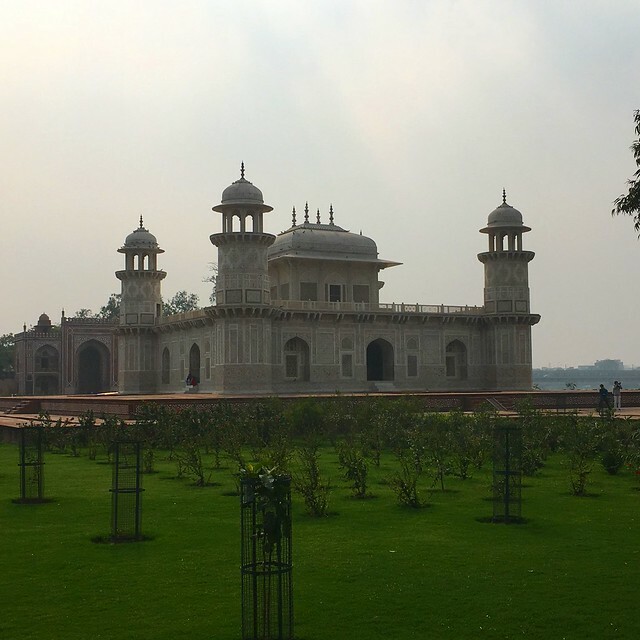 Built in 1628 it is the tomb of I’Timad-Ud-Daulah. We walked and posed for photos taking in the setting. Pretty patterns and crisp marble reflected the sunlight on a hot afternoon. We then jumped in our tuk-tuks and headed to the Moon Garden. The gardens themselves were unimpressive but the view they gave you was. The Taj Mahal from the back against the river. 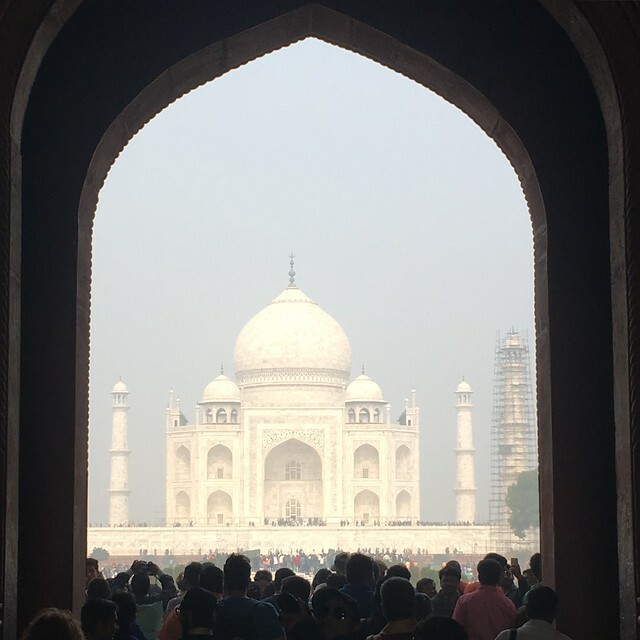 Of course the Taj is symmetrical so it doesn’t really matter what angle you view it from. It stood majestic on the bank with thousands of people encircling it. They looked like tiny ants or creatures from the other side of the river. One of the 7 Wonders of the World it was easy to see why. Again more photos were taken and we departed looking forward to our proper visit the next day. That evening we first went for drinks on a roof top, drinks were fine but our guide warned us off of the food. A front view this time slightly to the right hand side as you look at it. From this lofty position you could also see the east, south and west gates as well as the royal entrance and mosque to the left and its symmetrical counterpart to the right. As the sun was setting it gave the building a red glow and we again snapped away. The following morning we awoke eagerly, however fog had covered the city and our guide, Jai, showed us a picture his friend had taken. The Taj was covered in fog, the 4 towers barely visible. We opted instead to wait for an hour visit the Agra Fort and do the Taj in the afternoon. The Agra Fort was imposing and impressive, dominating the city’s sky line. The main residence of the emperors of the Mughal Dynasty till 1638, we explored with a local guide the many passages, palaces and views. 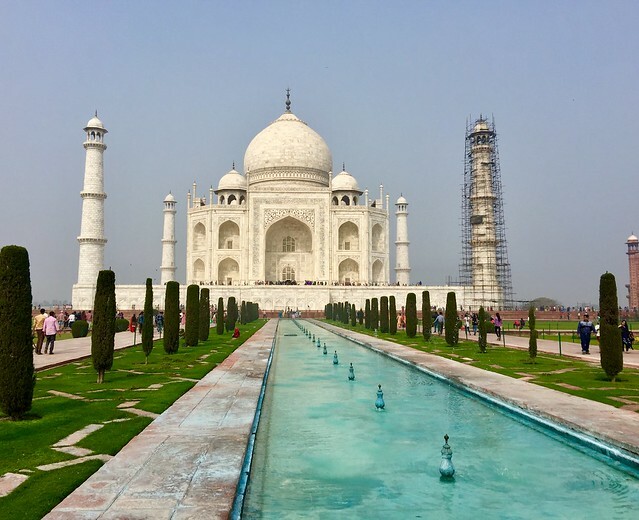 Worth the visit when in Agra but nothing to the main show that was coming up. We had now also visited several forts so they were all beginning to look the same. We hopped straight in our transport and headed towards the Taj. You are dropped off about 1/2km from the main gate. No vehicles are allowed (except for electric ones) to limit the amount of pollution the building is exposed to. We walked down the wide road (odd to see a road in India devoid of traffic) to the ticket offices. The price has doubled recently 1000 rupees for foreigners and 50 I think for locals. Next came the search. We had been advised not to bring several items: extra batteries for phones/cameras; pens; anything that would promote a brand (so no knitted yoda- see his Instagram for more photos); food/drink (though water was allowed); selfie sticks; creams/lotions; tripods; video cameras (so our drone was out to); the list went on and on. So just take your camera, phone, wallet and water and leave everything else behind. They are strict and do pat you well down and search your bag throughly. Finally we walked through the west gate, and through the entrance (a building itself worth a visit). You first viewed the Taj through an archway and stepped out onto a platform to see all its glory. People jostled trying to get the the perfect shot, especially the central shot. Our local guide told us about its history, age and significance. It was commissioned in 1632 by the Mughal emperor, Shah Jahan, to house the tomb of his favourite wife, Mumtaz Mahal. We had and hour and half to explore the site. Photos are best from a distance as once you are up close the colossal size make it impossible. We found the ‘Dianna’ bench (along with 10,000 others) and took photos with the water in front. 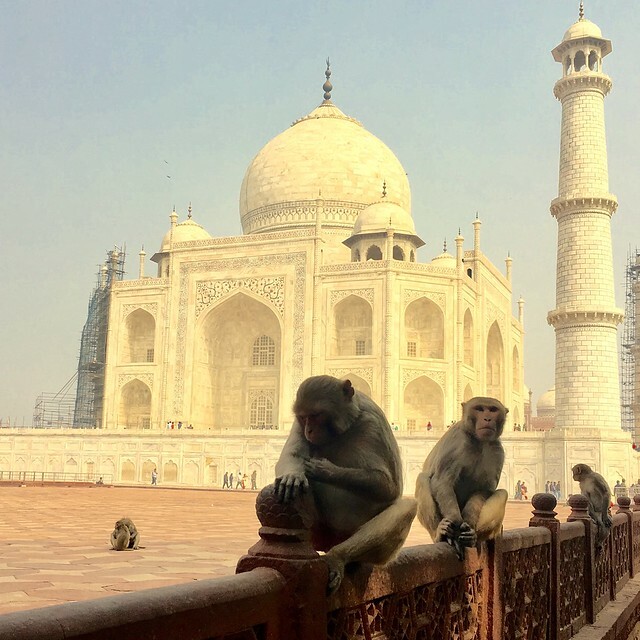 We wandered around the side and a troop of monkeys crossed our path causing us great delight as we snapped photos of them with the Taj in the background. 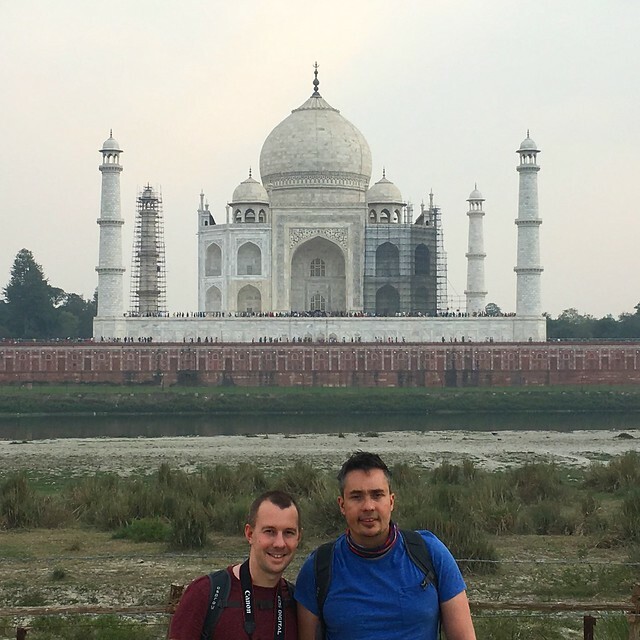 We entered with shoe covers over our feet and viewed the tomb of Mumtaz Mahal. No pictures are allowed inside and one of our group witnesses a venerable being taken and thrown across the hard marble. Though the many members of the Indian army that were there happily snapped away. After viewing the beauty of the white marble, then inlaid jewels and precious stones we wandered through the gardens. Overall it is a magnificent building, astonishingly finished and made considering it was built in 1632 by 20,000 people. It was slightly strange finally standing on and in a building you have always seen and heard about but don’t think you’ll ever visit. A must when in India. We had a late train to Jaipur, the 3rd city of three to complete the golden triangle.